Remembrance Packages includes Remembrance Memorial Cards, Memorial Packets, and white envelopes. • Remembrance Memorial Cards measure 5" x 3.5". 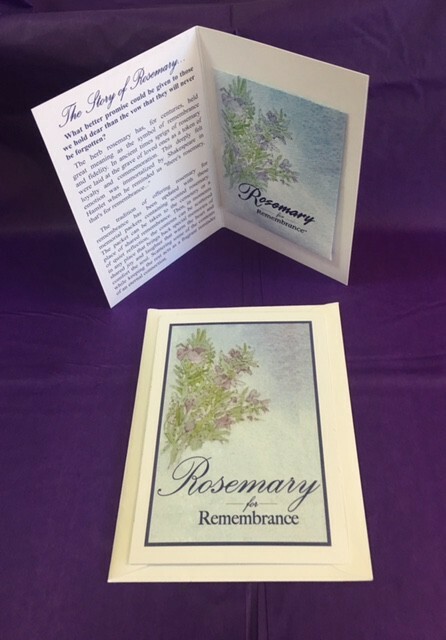 These folded cards are soft lavender in color and "Rosemary for Remembrance" is elegantly scripted over a design of rosemary sprigs on the front of the cards. Inside of card reads: What better promise could be given to those we hold dear than the vow that they will never be forgotten? The herb rosemary has, for centuries, held great meaning as the symbol of remembrance and fidelity. In ancient times sprigs of rosemary were laid at the grave of loved ones as a token of loyalty and commemoration. 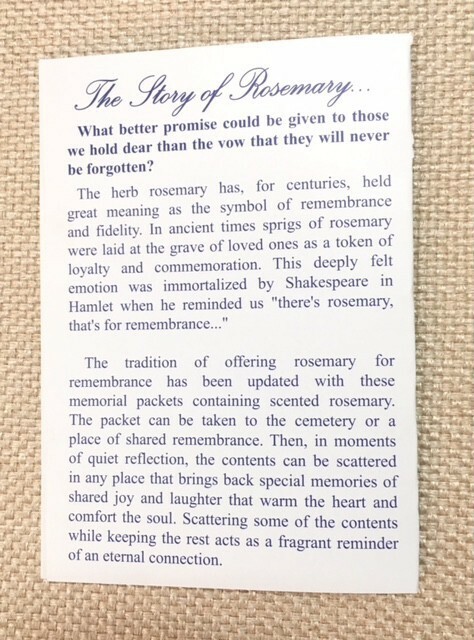 This deeply felt emotion was immortalized by Shakespeare in Hamlet when he reminded us "there's rosemary, that's for remembrance..." The tradition of offering rosemary for remembrance has been updated with these memorial packets containing scented rosemary. The packet can be taken to the cemetery or a place of shared remembrance. Then, in moments of quiet reflection, the contents can be scattered in any place that brings back special memories of shared joy and laughter that warm the heart and comfort the soul. Scattering some of the contents while keeping the rest acts as a fragrant reminder of an eternal connection. • Standard White Envelope is included. 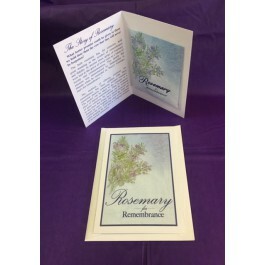 • Memorial Packets These beautiful lavender envelopes contain a re-sealable packet of scented rosemary botanicals with the story of rosemary printed on the back. In moments of quiet reflection, the contents of these packets can be scattered in any place that brings back special memories. Rosemary for Remembrance memorial packets contain scented rosemary which can be taken to the cemetery, or any place of shared remembrance. Packets measure 2-7/8" x 3-1/2" in size.